Country music fans have so many choices when it comes to concerts in the coming year, but the Dierks Bentley concert tour is definitely not one to be missed. Presently on the road with Randy Houser, Dierks Bentley has now released his tour plans for early 2017 and he will be going on the road with Cole Swindell, and Jon Pardi will even be at some of the shows. It’s quite a nice evening for just about any country music fan. Dierks Bentley, aka Frederick Dierks Bentley, is known for some great country songs such as Different For Girls, Somewhere on a Beach, Drunk on a Plane, What Was I Thinkin’, Come a Little Closer, Home, Every Mile a Memory, Free and Easy (Down The Road I Go), plus many more. His latest album, released in 2016, was named simply ‘Black’ and was the 8th studio album release from the country star. If you want to see him in concert, we suggest getting your tickets as soon as you can. Look Below for the latest list of Official DIERKS BENTLEY tour dates, links to look for tickets, and some cool music videos of some of his more popular songs. 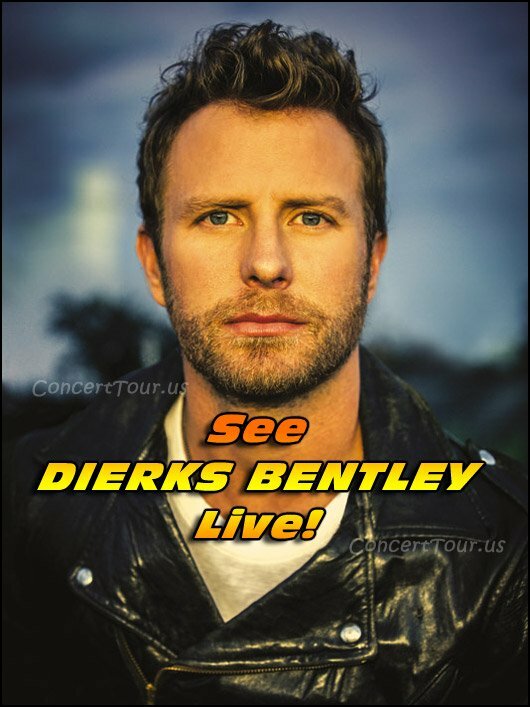 Don’t miss your chance to see country megastar DIERKS BENTLEY live in concert! Check back often as we will add to the above list as Dierks Bentley adds to their tour itinerary. DIERKS BENTLEY is awesome to see live so don’t miss any of his shows.